8 Way Hand-Tied - This is a method of securing the springs of a seat to one another. This is a labor intensive process, and is usually only seen on higher end pieces. The benefit is that furniture featuring 8 way hand-tied construction is both longer lasting and has a better feel when sitting on it. Acanthus Leaf - A popular Greek decorative motif adapted from the acanthus plant. It is frequently used in pediments and other raised decorations, and found in almost all classic design. Armoire - This is a large movable cabinet with doors traditionally made to store clothes, but now commonly used to house a TV. Bombe - “An outward swelling”. Term used to describe the curvature of chests, bureaus, and armoires. Bonnet Top - A broken arch pediment that extends over the entire top of a tall case piece. Burl - A tree knot or growth that shows beautiful graining when sliced. Burls are used for inlays and veneers, and have been prized for their beauty for centuries. 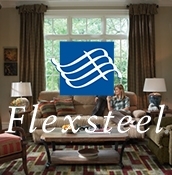 Camelback - Sofa design recognized by a curved back containing a large central hump. Casegoods - Wooden furniture designed for storage. Chenille - This is a type of fabric that is often used in the manufacture of furniture. Chenille is a durable, soft fabric, easily made into patterns. Cheval - A large vertical mirror hung between two vertical posts, also called a free standing mirror. Corner Blocked - In the frames of soft goods, and in high stress points for case goods, an extra block of wood is often added to joints in order to give additional support. This technique is used on excellent quality furniture. Eurotop - This is a term used in mattresses to describe a method of adding extra padding to the top of a mattress. It is similar to a pillow top, but without the indented gap that can cause your mattress to pull your sheets off. Fleur-De-Lis - A classic French design of a stylized flower. Fluting - Decorative grooving on any horizontal or vertical surface. Foam Encased - Foam encasement is a piece of closed cell foam rubber put around the outside of a mattress to give it support at the edges. Foam encasement allows you to sit or lay on the edge of a mattress and still experience the same support as the center of a mattress. Gateleg Table - A small drop-leaf table that is supported by a leg that swings open like a gate. This was popular in the American Colonial period. Inlay - This is a decoration made by placing small piece of decorative wood into large areas of plain wood. Inlays have been used for centuries to enhance the appearance of furniture. Innerspring - This is the most common type of mattress in which the support of the mattress is derived from coiled springs. Kiln Dried - Lumber used in frames of some high end upholstery is first dried in a kiln. This process strengthens the wood, and keeps it from warping due to humidity over time. 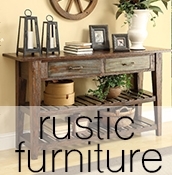 Look to kiln dried frames for long life from your furniture. Ladder Back - A chair in which the back is made from horizontal pieces of wood resembling a ladder. "Leather Touch" - This term means that every place you touch on the furniture, while sitting on it normally, is made from leather. The back and sides are made from leather match. This type of construction is used to reduce the cost of the piece for the consumer. Loveseat - A small sofa made to seat two people. Microfiber - Microfiber is a synthetic material made from extremely small polyester filaments that are woven in a manner to reduce soiling of the material. Microfiber wears very well, and is perfect for people with pets and small children. Ottoman - A low upholstered seat used as a foot stool. Pillow Top - This is a type of mattress in which an extra layer of padding is added to the top of the mattress. Pillow top mattresses can be recognized by the gap on the side, near the top of the mattress. Scatterback - Sofas and chairs that have many loose pillows for a back rest are considered scatter back. Slat Pack - Slat packs are used instead of a box spring on many pieces of youth furniture such as bunk beds and loft beds. Most companies charge separately for these, but not at Olinde’s. Splat - Center piece of the back of a chair used for support. Trestle - A braced frame composing the full support of a table. Trundle Bed - A small low bed that is stored under a larger bed during the day time. Veneer - This is an often misunderstood term. Most people think that furniture that has been veneered is of lower quality, primarily due to the marketing of particle board under this name. Veneering is actually a centuries old process of adding thin layers of decorative wood on top of more solid wood for support. Some woods, although very pretty, are not strong enough for construction purposes. Visco Elastic Foam - Visco elastic foam is closed cell foam that does not press back when pressure is applied. 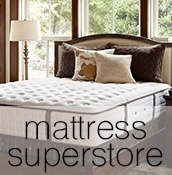 It is marketed under the names Tempur-pedic and memory foam, as well as others. The advantage to visco elastic foam is that it eliminates pressure points and provides for a better nights sleep.